Written on January 31, 2007 by Rylan & Kaitlyn. Written on January 31, 2007 by Kevin. Scenario: Your local grocery store is having a great sale on soda. There is a limit to how many each person can buy. You see a family of 3 kids and 1 mother taking up 2 of the self-checkout lanes trying to maximize their purchase. You look at what they are purchasing and its only soda. You try and count but there are just too many of them. You estimate at least 12 12-packs of Coca Cola. Answer:You grind your teeth and be glad that it is not your own child that is drinking soda all day long. You appreciate that your son drinks water non-stop throughout the day. You marvel in the fact that your son is not currently on path for diabetes or other health problems. You leave being the better parent. Written on January 30, 2007 by Rylan & Kaitlyn. My mom had found that the DoodleBops were coming to Arizona months ago so when Christmas came around, it was pretty clear what I wanted. My grandma and grandpa both surprised me by getting us all tickets. Boy was I excited. After my dad got home from work, we headed down to Tucson to go see the very anticipated concert. It took us over 2 hours to get there which was fine for me because I got to sleep. Dad was under the impression that it started at 7:30 so he was diddly doddling down the road. When it turned out it started at 6:30 instead, he had to carefully get to the arena. We got there just in the knick of time. We had a chance to check out all of the nifty DoodleBops souvenirs before the show started. I was simply amazed when their music fired up and they showed up on stage. I was star struck. We found our seats which turned out to be great. They were probably 25 feet from the stage. Awesome! They played all of my favorite songs and when I had a chance, I was dancing around. I was so excited that I couldn't stop needing diaper changes. I really liked seeing them all but it was a bit difficult to stay still. I wanted to get out there and dance but there was just not enough room. It's hard being held for so long so I ended up getting a bit fussy throughout the show. I think that one of the best parts of the entire concert was seeing my dad dance and sing around. He was really into it. There were a bunch of other dads there as well, some danced and some did not. I know that my dad sure has some moves. The concert ended and we made our way back home. I think that I would love to go back to another concert someday. In the meanwhile, I can check out my souvenirs that my mom bought for me. I know that they will go great in my new room when our house is built. Thank you so much grandma and grandpa for allowing us to go to this concert. We had a great time. Rylan enjoying his park visit. Written on January 29, 2007 by Kevin. Written on January 26, 2007 by Rylan & Kaitlyn. Wow what a week this has been. We have been so busy this week running around doing all types of crazy fun stuff. So far, the best thing was seeing Mickey Mouse and the Disney on Ice show. I really liked it even though I was a bit squirmish at times. We had to wait a long time before it started so I just couldn't handle that well. Once the show started though and I got a taste of some cotton candy, I was set to go. I got all excited when I saw my pal Mickey and all of the dancing skaters were great. I love clapping and throwing my hands in the air with excitement. It was a really fun time. Dad took a work day trip to California yesterday. I was a bit jealous because he was so close to Disneyland, but I know he wouldn't have gone without us. He was gone all day so it was just me and mom. When he finally got back, he took us to a nice Asian restaurant where I got to try some teriyaki chicken and rice. Boy was that good. It got me into a great mood. To finish off a great week, we are driving down to Tuscon for the DoodleBops concert! Yippy! We are leaving today after dad gets home from work. It's going to be a little bit of a drive but I know it will be worth it. I love dancing to the DoodleBops. My dad will take a hundred pictures I bet again so expect to see some of those. Boy I can't wait! Have a great weekend. I know that I will. Written on January 24, 2007 by Kevin. Wednesday night we attended the Disney on Ice showing here in Arizona. Once the show began, Rylan did pretty well and watched everything he could. We kept him extra occupied with a bag of cotton candy which ended up all over his face as the picture of the day shows. The show was great. 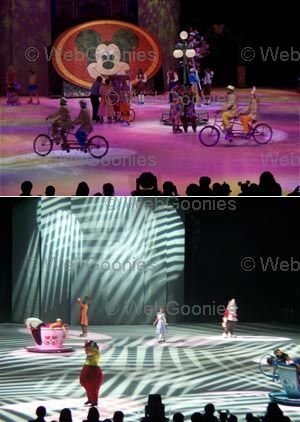 It included all types of Disney characters and the show was packed full of excitement. Rylan was excited at times and clapped on queue with everyone else. It looks like they will be having a few other great looking shows soon. I think this may be a show worth checking out every couple of years. My wife and I have always been proud to say that Rylan is a great kid that never gives us troubles. We take it as a bit of self accomplishment but as we are beginning to see, we do not always have control over Rylan's actions. Rylan is now 15 months old and is quickly moving to the dark side. The dark side, filled with tantrums and fears. His laid back attitude is slowly falling away and he is beginning to be taken over. We have seen a huge increase in tantrums recently that we can only say is either terrible twos, teething or overall not feeling well. He has recently been through a lot with his long sick time, high fever and otherwise abnormal weather. He is also pushing through some of his last few teeth which was always a good reason to cry. The one thing we of course never wanted to deal with was the terrible twos. The main points of difficulty that we now encounter is when attempting to change Rylan's diaper and place him into his car seat, stroller or shopping cart. He simply doesn't want to be bothered with it. He would much rather have us hold him than be any other place. This is making life interesting while taking him to run normal errands or even dinner out. Tantrums are now a thing of the present and we are having to quickly adjust, or at least attempt to. The daytime while my wife watches Rylan now consists of a lot of crying while Rylan wants to be held. I experience this as well when I come home and have found few things that can help tame the situation. The old trusty 'peakaboo!' just isn't working much any more. Even pirate talk that he has always enjoyed is beginning to become worthless. A Donald Duck impersonation is becoming our only help. We are holding onto whatever we can to help Rylan before he turns to the dark side completely. We are committed to fighting this evil as long as we need too. May strength be given to us and all parents who encounter this evil beast. Written on January 23, 2007 by Kevin. It all began months and months ago when we first took Rylan out to eat with us and have him sit in his own high chair. We were eating at our local mall and we had to hunt down a high chair. After finding one, we come to find out that the straps had broken in one way or another. Looking for another chair resulted in many of them also being broken. Being the concerned parent that I am, I reported it to the mall customer service doubting anything would be done about it. We have taken Rylan out to many other places since this time and I am simply amazed at how many restaurants have broken high chairs. These range from broken straps, clips or even missing harness all together. I seem to always get a confused look on the waitresses face when I ask that we get a new high chair because the one they gave me was broken. What is concerning is that over 50% of the high chairs that Rylan has been given to sit in, would be considered unsafe. I cannot understand 2 things in this situation. Why are these things all broken? Who is doing what to them that they all break? Are they just so cheap that they end up breaking soon after being put out there. Second, why isn't anyone replacing these? Do they not feel that this is an issue? Maybe they do not have children of their own and do not understand the reason for the safety belt. I think that they would understand it if a child was to fall out and hurt themselves and they were handed a lawsuit. Is it just Arizona or do other places have just as much of a problem with broken highchairs? Do you report any broken high chair that you see? Written on January 19, 2007 by Rylan & Kaitlyn. I hadn't posted a week in review last week because I was hanging out at Disneyland. It was pretty fun. I had some teeth coming in so I ended up being fussy a decent part of the time. That made it not so fun for any of us. I loved the Jungle Cruise ride and I am definitely going to request going on that each time we go. I was simply amazed at all of the cool animals and when the piranhas splashed me a little bit and when an elephant shot mist at me, it was almost like I was in a jungle. Yesterday, I turned 15 months old so I went in for my doctor checkup. They said everything looks good but I had to be tortured with 3 more shots. But let me tell you, that wasn't even the start of my problems for the day. All day I had been giving my mom problems because of my aching teeth. The shots certainly didn't help. The real problem came when I just couldn't sleep comfortably and at 3:00am this morning my mom took my temperature. It was 104F. Jeez! We headed out to our local urgent care and what do ya know, they are closed. So as I am acting up even more, dad decides to just take me to the emergency room but they had over a 4 hour wait. We decided to skip on that and just drove 15 miles to an overnight pediatric office and they took care of me. My temperature had dropped down to 100F at that point but they gave me a bit of medicine and confirmed that one of the shots I had been given could have caused this issue. It's weird because I don't think I had this problem with this same shot last time. So back to my teeth, It has been a rough week. I only have a few more teeth before they are all in so I am really looking forward to that. I know that no one is looking forward to me getting them though because of the squealing that is involved. Maybe we can stop by a store for some ear plugs. I think that's it for now. Have a good weekend. Written on January 18, 2007 by Kevin. Pregnancies are each very different for every woman, my wife is no exception. My wife's first pregnancy consisted of serious morning sickness, cravings of pizza and ice cream cakes and one heck of a cold. This pregnancy though has resulted in a bit less morning sickness which tends to be caused by Rylan's wonderful diapers first thing in the morning. Cravings have been minimized to shredded beef and while my wife currently has a cold, it is not nearly as bad as the first pregnancy. One thing that has definitely remained the same however was that we can never decide what we want to have for dinner. Whether it is eating in or taking something to go, we can never decide. My wife is the pregnant one so I am all for letting her decide what she wants to eat but when she can't make up her mind, we sit and wait. This can obviously be stressful as we both sit their hungry with Rylan looking around at us like we are nuts. One thing that I have noticed is that during this pregnancy so far, I am not nearly as excited. No, it's not that we weren't trying for this baby, it's just that I have already gone through it once. The first pregnancy was a brand new thing and while the doctor visits and ultrasounds are fun, they have already been done before. Does that make me sound like a bad father? Maybe so. I told my wife that I was going to keep her pregnant so that she would retain her belly and I am looking forward to it again. She is now at 13 weeks pregnant and a belly is definitely beginning to show. I had no idea how cute I would find my wife while she had her pregnant belly but that is certainly the case. Written on January 17, 2007 by Kevin. While doing my normal Disneyland forum scours a couple days prior to our Disneyland trip, I came across the Disney's Soda Fountain and Studio Store. This was a definite new place for me as I had never seen the words spoken anywhere before. I knew we had to make a trip there. After holding out and not letting my wife know, we took a drive to Hollywood Blvd which is where the Disney's Soda Fountain and Studio Store is located. 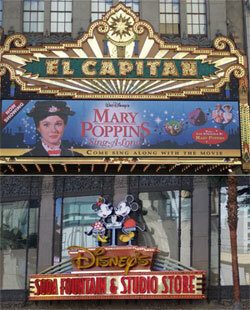 In addition, right next door is the El Capitan theatre which is a pretty common place for Disney movie premiers, just a few feet from the Mann Chinese theatre. We walked in and took a look through the store which had a few new things that we had never seen such as a Mary Poppins doll and exclusive Disney Soda Fountain pins. We have begun Rylan on a Disney pin collection so we ended up picking him one of the limited edition pins to mark the visit. We sat down for lunch while Rylan kept entertained with the help of some yummy tasting crayons. My wife and I both had the chili in a bread bowl which wasn't too bad. Rylan was ordered a grilled cheese sandwich shaped as Mickey but he wasn't going for that. We ordered a chocolate malt to go and enjoyed it while looking at the stars on the Hollywood walk of fame. We hunted down a few of the Disney classics characters. Overall experience was great. I think that we will be frequenting this place on each of our visits to Disneyland. It is a reasonable drive and with enough things to do down there, it's worth it. The area is crawling with unauthorized people dressed up in all types of outfits that want a few dollars for a picture which just adds to the atmosphere. I would definitely recommend checking it out if you are in the area. Written on January 16, 2007 by Kevin. My wife and I have rarely spent the time to check out the Jungle Cruise ride while at Disneyland but this time, we decided to go ahead and take Rylan. Due to the cold weather and more teeth coming in, he was not as responsive to a lot of the things he was in the past so when we decided to try the Jungle Cruise ride, we weren't sure how he would react. What we weren't prepared for just how excited he would get. We placed Rylan down on the seat between us so that we could keep an eye on him and soon after the tour began, he quickly turned around to check everything out. He didn't care if it was a huge elephant or a tiny little leaf, he was amazed. I wish I had gotten more pictures like the one below as it just shows his excitement on a whole different level. We ended up taking Rylan on the tour again and if it was up to him, we would have never gotten off of it. We lucked out this trip as the cold weather and Friday visit allowed us to roam in the park with only small crowds. For those who are not familiar, you can ask one of the cast members at the Jungle Cruise for a map of the tour and they will provide you this. It's a great free souvenir. Written on January 15, 2007 by Kevin. My wife and I went to our first real ultrasound on Thursday and we were pleased to hear that they also do 3D views. 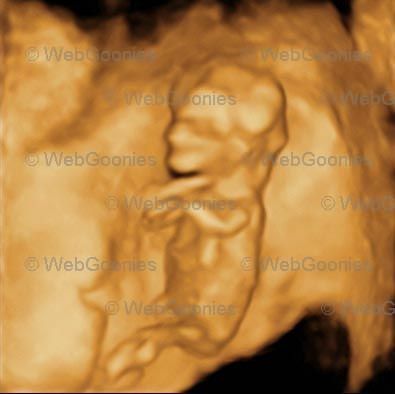 We were always interested in having 3D ultrasounds taken throughout the pregnancy and it appears that it may happen now. Here is our new baby at 12 weeks old. We are looking at a July 26th due date. Written on January 11, 2007 by Rylan & Kaitlyn. Today is a big day, we will be going to the office to get another ultrasound for my mom. We are going this time to determine how far along she actually is. I know it's going to be exciting seeing my brother or sister again. I got really excited last time. After the office visit, we are taking off for Disneyland. It's about a 6 hour drive which I will likely sleep most of the way through. The car rides are always pretty calming. My grandpa got us a portable DVD player for Christmas so when I am up, I will always be distracted by the DoodleBops, Little Einsteins or even Mickey Mouse Clubhouse. Monday will be the next post from my dad. Definitely expect some pictures as I know he will end up taking a bunch. Until then, have a good weekend. Written on January 10, 2007 by Kevin. I think he will get a kick out of this picture when he gets older. I know that my wife and I will still be looking back at it and laugh. Written on January 9, 2007 by Rylan & Kaitlyn. Mom just gave me the good news that dad booked us a room for this weekend right near Disneyland. What does that mean? Well it means that we are going back to Disneyland of course. Whohoo! Boy do I love that place. Since mom and dad recently had their anniversary they decided this was a good time to take another trip there. Mom told me that when I was still a baby inside her belly that they had gone to Disneyland as well so they like to call it a Babymoon trip which simply means one good trip before the potential for a long stay at home. 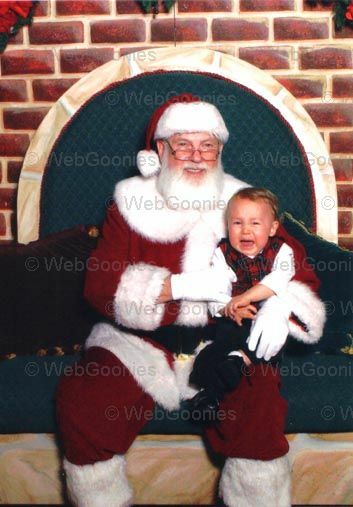 Of course, that didn't happen with me because I was such a good little guy. We went first when I was only about 6 weeks old. It turned out pretty well though. Last time we were there for my birthday and my mom had forgot a sippy cup for me. Boy was that a mistake. Disneyland sells sippy cups but they are a bit expensive and they aren't leak proof. In fact, the tops almost fall off if ya tip it upside down. Talk about a worthless souvenir. So we will be at Disneyland this Friday so my Week in Review post will likely be postponed until Saturday maybe when I have a bit more time to do some writing. I think that this is going to be a great trip and I even hear that my dad has a special surprise for me and my mom. Phewy as he won't tell us what it is. Written on January 8, 2007 by Rylan & Kaitlyn. What could be the next best thing to going to Disneyland? Disney on Ice of course! We will be going to the Disneyland Adventure show in a couple of weeks. Normally the Disney on Ice is only a bit interesting looking but when I found out that they were doing a show about Disneyland, I knew I had to tell my mom. After a bit of talking with dad, we went down to the ticket booth this last weekend to buy up some tickets. We picked up some great seats for just over $30. It helps to be within the freebie age limit. Of course, it helps a lot to have a 2 for 1 coupon as well. I am really looking forward to this and I will certainly be posting pictures when the day comes. 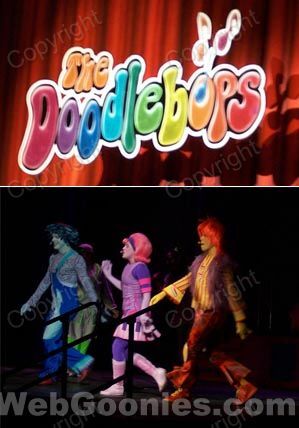 Oh ya, I am going to a DoodleBops concert down in Tucson just a few days after Disney on Ice as well. Holy shmoly this is going to be a good time. Written on January 5, 2007 by Rylan & Kaitlyn. First off, I would like to say Happy Anniversary to my mom and dad because today is their day. I am sorry for not getting you anything mom so I will make up for it by being extra good today and even giving you a few hugs. Teeth, let me tell ya, they can certainly be a pain. My teeth are coming in fast now and I think I may be almost done. Speaking of teeth, I sure love it when my dad brushes my teeth right before bed. I get so excited when I see him grabbing for the toothbrush and when he goes for the toothpaste, I can't hold back a smile. I do like my privacy and every night I shut the bathroom door before dad begins brushing. He likes to tease me by sticking it on my tongue. It's fun though getting your teeth brushed and it taste good as well which is always a plus. My mom and dad knew it was coming but since I am now a toddler, I am able to get fussy and throw fits whenever I want too. I always give dad a hard time when he says I need a diaper change. I mean, just because I'm poopy doesn't mean I need a change. Why can't I go back to playing with my toys in peace? Why does he need to harass me with these crazy diaper changes? We went over to my Aunt's house last night and gave her and her husband a basket filled with baby goodies. They recently let everyone know they are having a baby as well so that will certainly be fun. I will get to see that baby a few times maybe before my own brother or sister arrives. I am not sure how well I will be able to stand the baby crying. I know dad says it isn't so bad but I just don't know. I know that my little cousin-to-be will be happy with all of the things that were in the basket. I have first hand experience with most of it. I guess that is all for now. Have a fun weekend. Written on January 4, 2007 by Kevin. For the past couple of months, many videos have been flying around the Internet of babies laughing. These are always great videos to watch when you need a quick mood change as its hard not to laugh with the kids. Their laughs are simply contagious. Rylan has always had a few things that definitely made him laugh but lately that has all changed. He laughs at just about anything that we do. It all began one night after we stepped out of our local Luby's restaurant. Rylan had just had a very filling meal and he was in a great mood. A simple "excuse me" caused Rylan to burst into laughter which continued for 5-10 minutes. This phrase has been used often now to get him to laugh, especially after a very filling and tasty meal. In the past couple of days his laugh has changed significantly. In fact, he now has about 5 different laughs that he seems to rotate throughout the day. Each of them are equally entertaining. His last laugh that he likes to show off could almost be considered a forced laugh when he almost yells while doing it. Definitely a semi laugh that gets everyone's attention. It's really amazing on what can turn his bad mood into a happy one just with a single "excuse me" phrase. It's one of those things that you hope never passes. Written on January 2, 2007 by Rylan & Kaitlyn. The year 2006 was a great year for me. I grew up from being a pooping little baby to a toddler making trouble whenever possible. I learned how to self feed and even took to the sippy cup really well. I think that 2007 will be another great year for me. Here are a few of my resolutions. - Learn how to use a spoon and fork. - Figure out how to climb the baby gate. - By the end of the year I would definitely like to be potty trained. - Give more hugs and kisses. But I think the most important thing that I would like to work on this year is being the best big brother possible. I can't wait until I find out if I will be having a brother or sister.